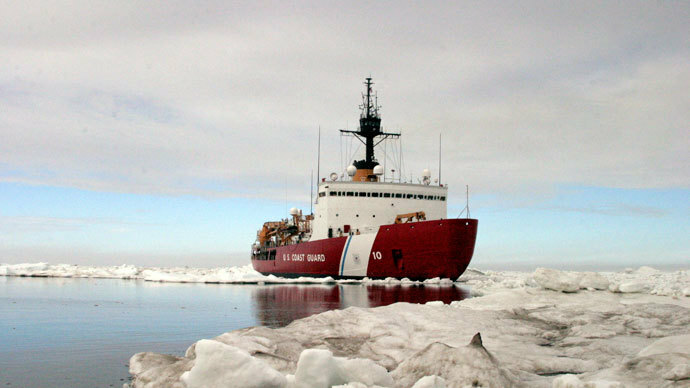 American vessel the Polar Star, the US Coast Guard's only active heavy polar icebreaker, is heading to the Antarctic to rescue over 120 crewmembers aboard Russian and Chinese ships trapped in heavy sea ice. According to the Australian Maritime Safety Authority's Rescue Coordination Centre (AMSA), it should take the Polar Star about seven days to reach Commonwealth Bay, depending on weather conditions. The 122-meter US icebreaker canceled its planned stop in Sydney after it received a request Friday from Australia, Russia and China to help the Russian and Chinese ships, who fear they may be unable to free themselves from the ice. According to an AMSA spokeswoman, the US ship has greater icebreaking capacity than the Russian and Chinese vessels. "It can break ice over six meters thick, while those vessels can break 1-meter ice," she told Australian Associated Press on Sunday. "The idea is to break them out, but they will make a decision once they arrive on scene on the best way to do this." The 22 crewmembers aboard the Akademik Shokalsky and the 101 crew aboard the Xue Long (Snow Dragon), which had earlier rescued the Russian ship’s passengers with the help of a helicopter, are currently said to be in no immediate danger, and have plenty of supplies. 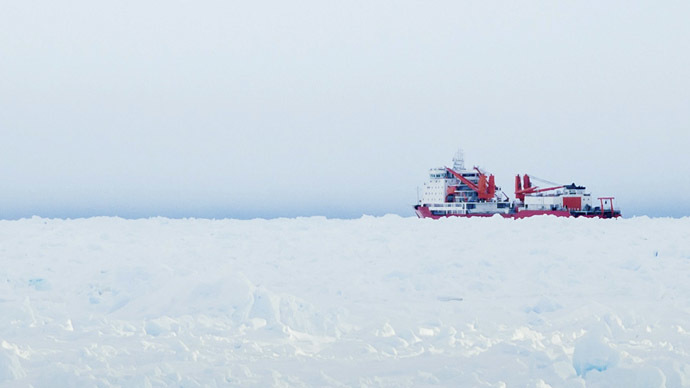 According to Chinese state news agency Xinhua, which has reporters on board the Xue Long, the vessel is currently surrounded by ice of up to four meters thick and is 21 kilometers from open sea. The Russian research ship Akademik Shokalsky, with 74 scientists, tourists and crewmembers on board, got stuck in a blizzard of up to 70-kilometers-per-hour winds hemmed the sea ice in around, and has been trapped in Antarctic ice since Christmas Eve. The ship has been on a privately-funded research expedition to Antarctica to retrace the footsteps of an Australian geologist who explored the Antarctic a century ago; the voyage was to visit Douglas Mawson’s Antarctic huts, which previously couldn’t be accessed because of an iceberg. Three icebreakers – Australian, Chinese and French – have so far been unsuccessfully trying to reach the Russian ship since December 25. The 166-meter Xue Long, which finally came to its rescue, reported Friday that it had also become stuck nearby. The Xue Long's movement has been blocked by a drifting kilometer-long iceberg, which constantly changed position and at times came as closely as 1.2 nautical miles (about 2.2 kilometers) to the ship, according to Xinhua reporters aboard. 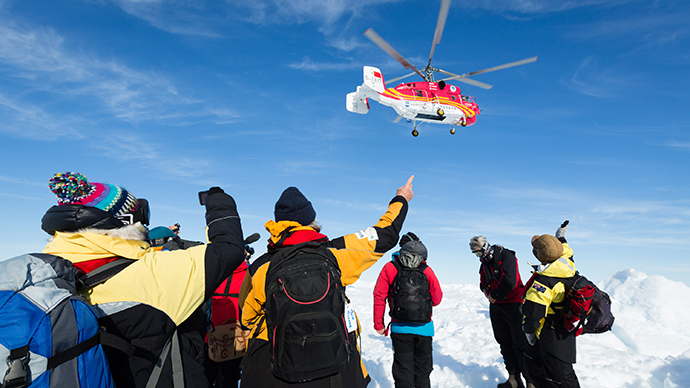 Despite bad weather conditions late Thursday, the Chinese ship's helicopter had managed to retrieve from the Akademik Shokalskiy 52 scientists, journalists and tourists and helped ferry stranded passengers to an Australian icebreaker the Aurora Australis. After the Xue Long reported it was stuck, AMSA told the Aurora to stay in the area with its rescued passengers on board, in case help was needed. Under international conventions, ships' crews are obliged to take part in such rescues and the owners bear the costs. The captains of both the Shokalsky and Xue Long agreed they don’t need further help from the Australian icebreaker as they would “provide mutual support to each other,” AMSA reported. On Saturday, AMSA allowed the Aurora to continue, because the Chinese and Russian ships were safe. It's now hoped that the Polar Star, with a crew of 140 people, could reach Commonwealth Bay and rescue the two trapped vessels by the end of next week. "Our highest priority is safety of life at sea, which is why we are assisting in breaking a navigational path for both of these vessels," US Coast Guard Pacific Area commander Vice Adm. Paul Zukunft said in a statement, adding they were ready to render assistance "in one of the most remote and harsh environments on the face of the globe." The Polar Star left its homeport of Seattle in early December to take part in one of its key missions, Operation Deep Freeze, to break a channel through the sea ice of McMurdo Sound to resupply and refuel the US Antarctic Program's McMurdo Station on Ross Island. That mission will now have to be postponed, however. Coast Guard chief warrant officer Allyson Conroy said the Polar Star's rescue operation could take up to three days. "You're looking at the Antarctic, which is a challenge in itself. You have weather and you have ice," Conroy told Reuters. "But our crews are very well trained and we expect to be successful in this mission." 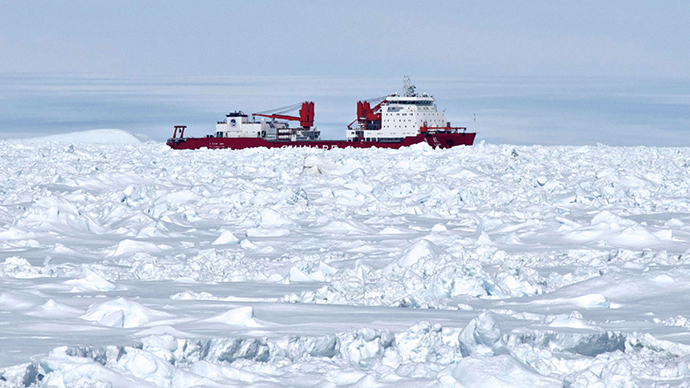 Chinese icebreaker stuck after Antarctic rescue?